See more objects with the tag domestic interiors, commercial interior, curtain, weaving, silhouette, loom. See more objects with the color lightgrey powderblue cadetblue dimgrey lightsteelblue or see all the colors for this object. This is a Textile. It was produced by Knoll Textiles. It is dated 1953 and we acquired it in 2011. Its medium is linen and its technique is screen printed on plain weave. It is a part of the Textiles department. Eszter Haraszty was head of Knoll’s textile division from 1950 to 1955. She also served as color consultant to Knoll Associates and frequently collaborated with Herbert Matter on the company’s promotional materials. Her strong color sense had a major impact on the “Knoll look,” as she moved the company away from the earth tones popular at the time and developed a coordinated palette of bright, clear colors across the entire textile line. Fibra was one of Knoll’s most successful print designs, and it remained in production for 16 years. It was selected for MoMA’s Good Design exhibition in 1953 and won the American Institute of Decorators first award for printed fabrics in 1954. To create the design, Haraszty asked photographer Erich Hartmann to photograph the wire heddles of Knoll designer Evelyn Hill’s loom. The photos were enlarged and edited to create a loom-width repeat. 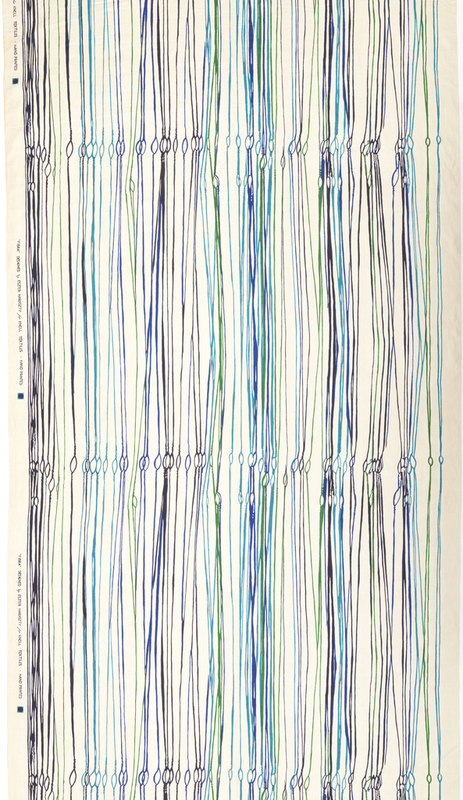 Printed in Haraszty’s vivid color combinations, the design is abstract and bold. This piece, at full width and over 13 feet in length, will be the first full repeat of Fibra in the museum’s collection. 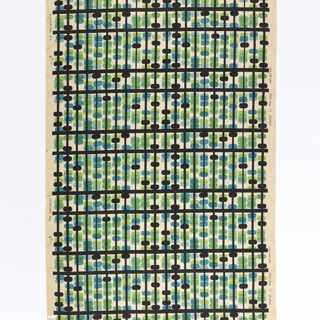 This object was featured in our Object of the Day series in a post titled Abstracted loom heddles. It is credited Gift of Larry Weinberg.